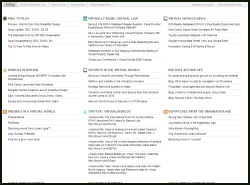 VB was just added to a cool web resource called Alltop for people who want to look at a lot of news feeds in one place without RSS hassles. There are a number of feeds there including “Celebrities,” “Egos,” “Design” and “Gaming,” among others. Here’s the “Virtual Worlds” news feed. I’m not big on endorsements, and I don’t get anything for saying this, but Alltop just works for me. It’s a project of former Apple evangelist Guy Kawasaki, and it displays the clean look that you’d expect. The initial view shows only headlines; hovering your mouse over a headline pops up the first paragraph or so of the linked story. Clicking then takes you directly to the original article on the linked site. For now, at least, there aren’t any ads. Besides VB, Alltop’s virtual world news feed features over twenty sites including New World Notes, Reuters, Terra Nova, the Second Life Herald, Virtual Worlds News, and others. They add new ones with some regularity. Alltop isn’t groundbreaking — RSS does this and gives you control over which sites you see, and there are other amalagamators out there too — but I hate how most amalgamators I’ve tried either destroy formatting or reproduce so much content that they’re basically vulturing posts from other sites, so I’ve never really gotten into them. I’ve bookmarked Alltop though, and I find myself hitting it fairly often, so I thought I’d pass it along.